To access the A&E Test Taker Module, login to UIS using an account with ALS Facilitator or ALS Consolidator role. Both user roles are referred to as TRO and can register test taker record. A successful login will direct the user to the main page of the UIS that provides access to his/her account. In the account context dropdown, select the office with ALS Facilitator or ALS Consolidator role assigned (see Figure 1-1 Office with ALS role). Go to the UIS top bar and select “Learner Information System” link to access LIS (see Figure 1-2 LIS link). The initial page for LIS is the Dashboard, user can access the ALS control panel via “ALS” link located between “Dashboard” and “Help” nav bar (see Figure 2-1 ALS Control Panel Link). Note that this link is only visible for users with ALS roles. A facilitator is required to be in the “active roster” of the division DepEd procured and delivered facilitators for the calendar year to be able to register test taker/s. The Division ALS Admin account is responsible for maintaining the facilitator’s list on a yearly basis. Note: For Facilitators experiencing problem using their accounts, kindly contact your designated ALS Division Admin for assistance (see Figure 2-2 Panel Display for Inactive Facilitator). For Facilitator/Consolidator that has no test taker added yet, his/her control panel will have an “add” button displayed to register the first test taker (see Figure 2-3 Panel for No Test Taker Added). For users who were able to register a test taker before, there will be a display count of A&E Elementary and Secondary test takers with buttons to add and list test takers (see Figure 2-4 Panel with Test Taker/s Added). In general, ALS control panel displays the date when registration started. Facilitator and Consolidator can add Test Takers with or without LRN. Click on the “Add” button in the ALS Control Panel to Add Test Taker. The system will display a verification page to ensure accuracy of the test taker data that is about to be entered (see Figure 3.1-1 Test Taker Data Verification). Select which document is your basis for the details you will encode. 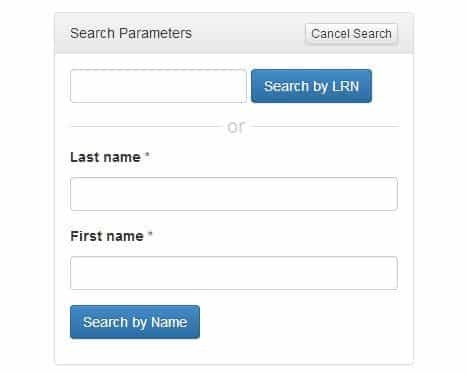 If the LRN you have entered is valid, Search result will display. Click on the preview link to view the Basic Profile of the Learner (see Figure 3.1-3 Search Result). Click on the Continue button and input ALS A&E Test specific data (see Figure 3.1-4 Learner Basic Profile and Figure 3.1-5 ALS A&E Test specific data). If you search the learner by name, input its first and last name on the field (see Figure 3.1-6 Search by Name) and click Search by Name button. If the system returned too many results, the admin should input middle name and birth year to make the search more specific. Click on the “search by name” button to do the search. The search result shall be displayed on the right part of the page with the learner’s details (see Figure 3.1-7 Search by Name with Specific Parameters). Click on the “Preview” button to view its Basic Profile. Finally, click the “Continue” button and input ALS A&E Test specific data to register (see Figure 3.1-4 Learner Basic Profile and Figure 3.1-5 ALS A&E Test specific data). Note that the “Intervention” setting under Test Specific Data shall be specified by an ALS Consolidator. Only Facilitators included in the division’s “Active roster” shall be available on the “Facilitator” dropdown list. This option and the Division list shall only be active if A&E Elementary or Secondary Intervention is selected. (see Figure 3.1-8 Intervention Setting). Once submitted, page will return to list of test takers. TRO may still update test level and venue of a test taker. Click on the “Add” button in the ALS Control Panel to Add Test Taker. Click on the “Learner Search” button to enter Learner’s first and last name. Click on “Search by Name” button to do the search (see Figure 3.1-4 Search by Name). Because we are adding a Test Taker that has no LRN yet, a verification message shall be displayed informing that the record was not found. Click on the “No, this is correct!” button to confirm that you have key in the correct data. A pop up message shall appear with the name you have entered (see Figure 3.2-1 Create New Record). Click on “New Record” to enter Test Specific Data then click “Add Test Taker” button to finalize record creation. If you search a learner by name (see section 3.1 – Search by Name) and the system returned related results but is not the user you are looking for, click on the “Not Listed? Create new record.” button (see Figure 3.3-1 Record Not Listed). A pop up message shall appear with the name you have entered (see Figure 3.2-1 Create New Record). Click on “New Record” link to enter Test Specific Data then click “Add Test Taker” button to finalize record creation. Access the ALS Control Panel by clicking the ALS link at the LIS mainpage (see Figure 2-1 ALS Control Panel Link). Click on the “List” link under the A & E Test Takers panel (see Figure 4-1 List Link). List of Test Takers shall display. Click on the “Update” link to access Test Taker Specific Test Data (see Figure 4-2List Link). Update details as necessary and click on the “Update Test Taker” button to commit changes. You may send feedback and inquiries to [email protected] or call us at +63 922 4104603 (Mondays-Fridays except Holidays, 7AM-6PM only).